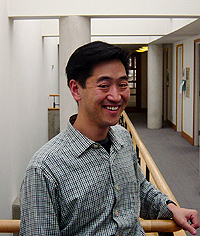 Ken Tadashi Oshima is Professor at the University of Washington. In the early 2000s, he spent time at the Sainsbury Institute as first a Handa Fellow (2003-4) and later Robert and Lisa Sainsbury Fellow Fellow (2004-5). 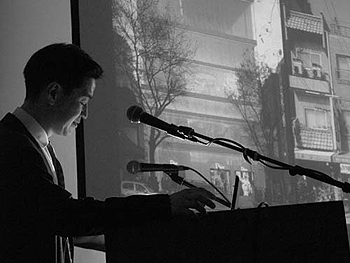 A trained architect and architectural historian, Ken has published extensively on the subject with a special focus on Anglo-Japan connections seen in architecture. In this issue, Ken reflects on his time as Fellow and his research projects. Hindsight is 20/20. In looking back a decade to my time in London as a Robert and Lisa Sainsbury and Handa Fellow between 2003-05, I realize what a pivotal time this was in my career. What began for me as a tremendous opportunity for post-doctoral research became the basis for three book projects and a broadened perspective of Japan within a global context. Through the vision of the Sainsbury Institute’s founding director, Nicole Coolidge Rousmaniere, I found the Sainsbury Institute to be one of the most vibrant centers of scholarship on Japanese Arts and Cultures in the world. Having just completed my Ph.D. dissertation ‘Constructed Natures of Modern Architecture in Japan, 1920-1940’ at Columbia University in New York in the summer of 2003, I arrived at Heathrow Airport during an unprecedented heat wave. Thankfully, I could move right into a flat in Russell Square adjacent to the London office of the Sainsbury Institute at SOAS that had been handed down from John Carpenter, who then was head of the Institute’s London office, to Sainsbury Fellows Keith Vincent (2001-02), Keller Kimbrough (2002-03), and then to me. Soon after I met the other Sainsbury fellows, Shane McCausland and Timothy Clark, and witness close relationships between Sainsbury Institute and the Percival David Foundation of Chinese Art and the Japanese Department of the British Museum and SOAS Faculty including Timon Screech and Lucia Dolce. I also had the great fortune to be a Sainsbury Fellow with Julie Davis and Tamaki Maeda, both graduates of the University of Washington, where I would subsequently teach. Upon arriving in Seattle in 2005, I discovered just how strong the Sainsbury Institute London-Seattle axis is in following the footsteps of Sainsbury Fellows Yukiko Shirahara (Seattle Art Museum Curator 2002-08), and Cynthea Bogel (UW). 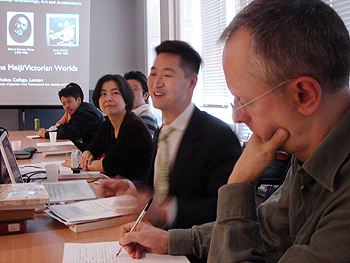 While the people of the Institute have come to form a truly global constellation, some of my most meaningful experiences as a fellow were the informal conversations between these people and opportunities to make connections between our respective disciplines and time periods within the broader umbrella of Japanese Arts and Cultures. Ken delivering a paper at the Reflections Conference. Such transnational trajectories also became the focus of my research at the Institute. My research on the designer Christopher Dresser (1834-1904), whose work connected botany, art, industrial design and architecture as well as England, Germany, Japan and the US, fortuitously coincided with a major exhibition of his work at the Victoria and Albert Museum and my participation in the accompanying centenary symposium. I also traced Anglo-Japanese design connections in the work of the East Anglian architect Thomas Jeckyll (1834-1904), whose Japanese-inspired pavilion for the 1876 Philadelphia Centennial Exposition ended up briefly in Norwich. To bring this Anglo-Japanese dialogue to the 20th and 21st centuries, I organized the joint Sainsbury Institute/Architectural Association symposium ‘Reflections on Japanese Modernism: Changing Visions of Japanese Modernism’ (May 2004) featuring architects Arata Isozaki and Archigram visionary Peter Cook. 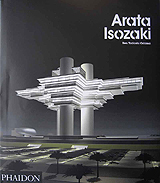 While the focus of the symposium was international interchange in both the pre and post World War II contexts, it also led to my research Isozaki’s work within a global context, eventually published by Phaidon in 2009. Most recently, I expanded my research on Anglo-Japanese design to look at the representation of Japan at world expositions and ‘Asia outside Asia’ in my co-edited book, Architecturalized Asia (University of Hawai’i Press/Hong Kong University Press, 2013). Although my time in London literally ended with a bang, marked by the 7.7 bombings around London in 2005, I can now see the many developments that have ensued both in my own research and the urban fabric of London in the period leading up to the 2012 London Olympics. Building on my work to situate architecture and design within a global context, I have come to lead the Society of Architectural Historians (SAH) in its transition from being a national to international organization and look forward to returning to the United Kingdom in 2017 when I will preside as the SAH President at the annual conference in Glasgow. I would like to sincerely thank the Sainsbury Institute and all of the people that constitute its broader vibrant constellation for their tremendous support and continued inspiration. 3. Oshima @ Reflections on Japanese Modernism Conference. 4. Oshima, Arata Isozaki, Phaidon, 2009.